We Created Much That Did Not Suit Us. Lets improve it all, by creating better now we know better, as the creative beings we Humans are, and as we are designed to be! Or just to make you feel foolish, from their tone of voice used, or to use outright ridicule – as made so popular by Britain – to make fun of what you say, so to diminish any possibility of serious receipt of what you say. 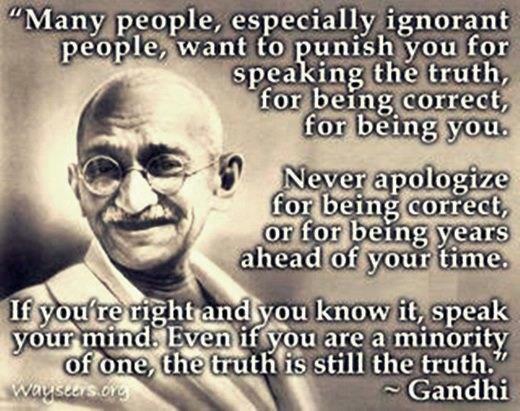 Wise words here by the wonderful Mahatma Gandhi, as always it is due to THEIR ignorance, and THEIR want or need to feel comfortable. People want to feel good. People want to feel good about choices they have made and are making. People do not want to know that they have made choices all their lives that have not been the best. And then, we are also designed to alter our choices and to do better when we know better, as we do now. Any personal feelings need to be dealt with, as the manager of our energy, thoughts, and feelings that we are, that are preventing any of us from living as we are intended. And as is the actual design of our species. It is fact that we have been influenced by humans before us, who made decisions affecting us, that were not appropriate for us/life/our planet. We have never had in place systems and structures that are adequate for us. We did not know the information at that time. Now we do, it is necessary for us to do better. This is also just fact, because we are Humans. It does not mean foolishness, or being ‘made to look like an idiot or a fool’, which is an enormous societal controlling tool used within the English language. Other language groups are shocked by how this fear keeps many English speakers silent, refraining even from natural curiosity conversing. To be human is to create, and we cannot stop it. We/our ancestors created all our inadequate systems and we can so easily create better ones. It is fact that all our societal structures are not designed for any of us. We did not know then what a human was, what a man was, what a woman was. These are all issues affecting all of us still, giving us all ridiculous problems, when they simply needn’t be. How much ridiculous problem presenting foolishness is everyone content to be living in?